In academia, textbooks are considered tertiary sources. But my gut tells me that most people read them as primary sources. It’s part of the process of maintaining and exerting authority. While reading through textbooks, some things are left understood, when they shouldn’t be. A few years ago I purchased a textbook about the restaurant business. I’m a bit of a nerd, and I was curious. I’m in the middle of reading chapter one, and I’ve already come across an issue. When it comes to “Restaurant Theory” what I’ve laid out so far are largely a bunch of disconnected ideas. – Restaurants are human building subcontractors. – Restaurant waiters are the “Mentor” in the customer’s monomyth. – Restaurants require minimum amounts of dookie pots. – Restaurant textbooks are full of information but still lack information. After reading John R. Walker’s intro, and perusing Audrey’s notes in the margin, I feel like I have some insight into the book. Not a critique, so much as a different take. I’ve been a part of a few restaurant launches (and some re-launches), but I am as much an expert on restaurants, as I am an expert on rocket surgery or unicorn colons. Audrey was a student. 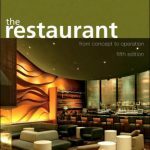 She purchased a textbook: The Restaurant: From Concept to Operation by John R. Walker. Audrey then donated that textbook to a Pasadena Goodwill where I purchased it circa 2012. Audrey, John R. Walker, and I are all going to go on a little journey. I’m not a restauranteur, but I’m considering creating a restaurant from scratch, and this seems as good a guide as any.